Usually when people think about kayaking the last thing in their mind is some sort of metaphysical or even spiritual experience. Most people who are into kayaking are just looking forward to spend some time out in the great outdoors. There is nothing like water underneath you and limitless sky and mountains to either side of you. It is a great way to relax, unwind and enjoy the very best that life has to offer. 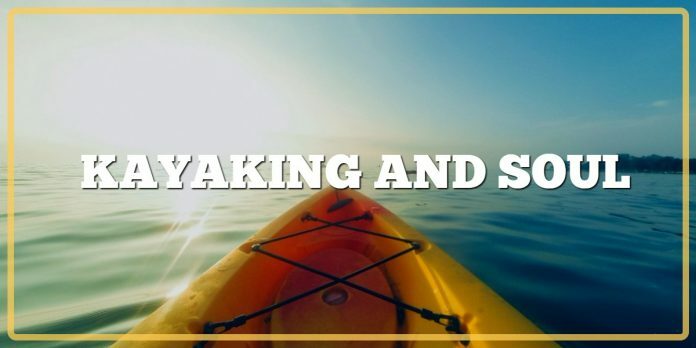 The sense of freedom is definitely one factor that has made kayaking such a popular sport. There is a tremendous opportunity for an emotional transcendence with this hobby. And we are not just talking about one person doing one activity on one body of water. We are talking about something bigger. When you are in a kayak and you are doing it with nobody else around you, you actually get a moment of honesty. You do not need to worry about the past that you cannot control and unwind. Similarly you stop worrying about a future that has yet to happen. Instead, your attention is focused on what is unfolding in front of you. You are living for the moment of honesty that enables you to really experience life on raw level. You are not using filters. You are not wearing a hat of so many roles. If you are a typical married person, you are not a mom at that point. You are not somebody’s sister, employee or somebody’s boss. You are just yourself and you experience all these things from that perspective. It is very raw, immediate and intimate. When you are kayaking alone, the raw experience that you initially discover and made aware of is that you actually have a lot of power over your world. Your Chi is not going to move a certain direction if you did not choose that direction. While it is true that if you are kayaking on the river, that river will push you forward, you have a lot of say as to how and where you end up. There is no wiggle room in this situation for excuses, justifications and the other mental acrobatic we normally engage in. You are just on a river and you are paddling away on your kayak, living moment by moment second by second. Another great thing about kayaking that speaks volumes as to human self-discovery, self-awareness and deep personal truth is the fact that each journey is different. Whenever you put your kayak on a river even if it is the next day you can bet that journey is different. You will see different things and sensations that you will encounter. The thoughts going through your mind are also going to be different. There is something about kayaking that really directs your attention to this realization. It highlights that the river has a metaphor for your life. All of us are on a river. Like it or not we are all on a river. This is called life. There is power in the river in the sense that there are many situations and chain reactions going on around us that we cannot control. This is similar to being on a kayak being pushed along by the current. With that said, your decisions do have an impact. It can have an effect on how fast you go or on your direction. In other words, you wake up realizing that life does not have to be a foregone conclusion. It does not have to be a pre-arranged pattern that you just need to show up for and will carry on alone. You have a lot of power. Just like exploring any river, the best way to get through life is to look at it as an adventure as well as an endless series of possibilities, opportunities, and yes, danger and challenges. That is all part of the river. It is important to note how this add up to the kind of person you become if you love kayaking. This is because you really cannot help but think through certain issues in your life. It may very well be that you would get this amazing perspective that you would not otherwise get if you are just too close to the center of gravity of problems in your life. It is like putting a hand on one side of your face. If you put your hand right on your eye it looks like your hand is so big and dark and that there is really not much that you can do in terms of your vision. But when you pull your hand out to an arm’s length distance you can start seeing in perspective that it is really not that bad at all. This highlights the fact that the reason why a lot of our challenges seem so impossible and hard is because we make them look like it is. We just choose to perceive them that way. The great thing about kayaking is that you can free your soul from such distortions. You are giving yourself a tremendous opportunity to see things with a fresh set of eyes. You will be surprised as to how toothless, pointless and ultimately worthless a lot of the “truths” and problems that you keep hanging on to. In a way, kayaking on a river is a great spiritual therapy because you end up rediscovering the deep fundamental truths on how you perceive reality, how you look at yourself and ultimately your place in the universe. This sounds heavy but they do have practical implications. Everybody speaks in different languages. We are actually all philosophical creatures. We just tend to communicate these truths in different ways. There is no right or wrong answer because it is all personal. Do yourself a big favor, next time you put your kayak down on that river and start digging deep, you will be surprised as to what you will find. Chances are you will really be happy because these realizations tend to reduce stress. They tend to relieve pressure. They also tend to give you the perspective that you crave.